Kegel8 Pelvic Toners have been featured in the latest issue of ‘Best’ magazine as a ‘fast and efficient way to tone and tighten’ the pelvic floor in their ‘Our Top Picks for This Month’ section. It’s been a very busy few weeks in the Kegel8 office as the Kegel8 word spreads far and wide. Following on from our rave reviews in Practical Parenting and Pregnancy magazine and on MadeForMums.com, Kegel8 Pelvic Toners have now been featured in Best Magazine’s ‘Everyday Essentials – Our Top Picks for This Month’ section. 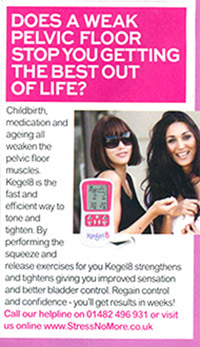 Calling our Kegel8 pelvic toners ‘a fast and efficient way’ to strengthen the pelvic floor, Best magazine goes on to say that they gives ‘results in weeks’ – what could be better? So come on ladies, what are you waiting for? Keep on Kegel8ing!